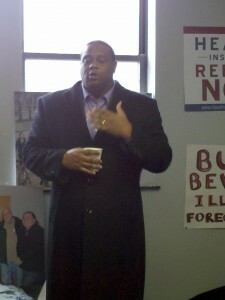 State Rep. Ed Gainey, D-24th, addresses Make It Our UPMC supporters before a canvass in East Liberty on Saturday, Feb. 16. Rep. Gainey says it’s time for UPMC to start acting like a real charity. Following our successful canvass earlier this month on Pittsburgh’s South Side, we signed up hundreds more supporters in East Liberty on Saturday to hold $10 billion UPMC accountable to its workers and the community. “It hasn’t been easy, and I know a lot of people in Pittsburgh think UPMC is too big and too powerful for us to make it act like we all know it should,” CJ Patterson, East Liberty resident and GI technician at UPMC Presbyterian, told the crowd before the canvass. 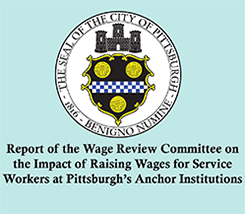 Sate Rep. Ed Gainey, D- 24th, also joined canvassers on Saturday and asked workers and the community to stand up for a living wage and for UPMC to pay its fair share. People are asking about UPMC’s role as a public charity. Does a real public charity’s CEO make $6 million a year? Does it use its tax-exempt status to enrich its real estate portfolio? Does it spend less than 2 percent of its revenue on charity care? Does a real public charity try to stop its employees from trying to have a voice on the job? 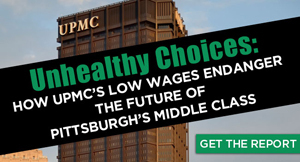 We asked those questions and the community answered loud and clear – it’s time to hold UPMC accountable. Let’s keep building the movement to make UPMC act like a real charity. Together, we can Make It Our UPMC.